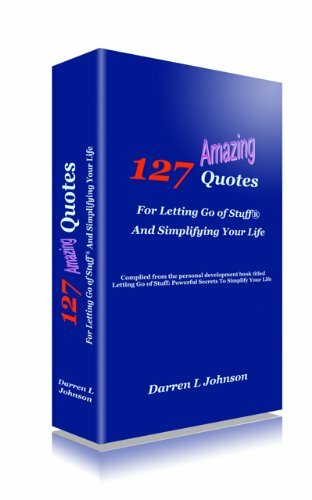 This entry was posted in Biz and tagged business, darren l johnson, internet, internet marketing, letting go of stuff, marketing, network marketing, online business. Bookmark the permalink. So much truth Darren! I recently learned of a study that showed the two distinguishing factors between sales people who make $50K and those who make $500K plus. It’s confidence and personal development! Hi Nancy. Thanks so much for your sharing. Awesome that you found that study. Good stuff! If you have the link to that particular study, please share it in your reply. It would be helpful for some – I am sure; including myself. Always good to hear from you…hope all is well. I was wondering about your experience with Chris and his internet program. It sounds good would like to know if you are participating and how it is going. Hi Beverly. Thanks for your response. YES. I have had a chance to spend time with Chris and like his work. I recommend that , if nothing else, sign up on the link I sent you and get on his email list. But the small investment for his program will pay off big time, if you can do it. Sounds like you are already familiar with his work. If so, then you know that it would be well worth the small investment to get that program. Plus, it may be tax deductible as a business expense (smile). I love your tag line – Getting Rid of Stuff! Beautiful! Personal development is huge – I love the way one of my mentors put it, network marketing is a personal development program with a compensation plan attached. Thanks for your comment Alan. Be sure and share this post with your team members – up and down lines. I think great discusions in which people can learn will take place on this blog over this topic of NOW WHAT. @Alan. Touching base with you Alan to see how your blog is developing. And to share with you the 2012 In Review report for the Letting Go Cafe. Happy New Year Alan.